← Do you have an Effective Internet Presence? Ever since reading Nik Fletcher’s review of the Shure E2C earphones last year I’ve had Shure kit on my mental “would really like some of those” wishlist. I now have a lovely set of Shure SE210 earphones. Well, I was able to try out a set of the Shure SE210s (the successors to the E2Cs) at MacLive Expo in London back in November, but I resisted getting them at the time. Now I’ve finally succumbed. The sound-isolation is achieved by the earbuds having foam or rubber sleeves that act like earplugs and block out the external noise. By default the SE210s come fitted with foam sleeves (picture here), which should be rolled between the fingers before you put them into the ears, where they expand to a neat fit. If the foam ones don’t suit, the box contains four alternative sets of sleeves which may fit better, and a cleaning tool for hooking out any dirt from inside the canal of the earphone sleeve. It’s quite an odd experience at first, since it does feel like you are wearing earplugs and yet able to hear the music… but the sound-isolation is great – people working in the same room as me will attest that it is now harder to catch my attention aurally! Another side effect is that I’m actually using a much, much lower volume setting on my iPod than I used to… I barely have to have any volume at all. As I type this I’m listening to iTunes on the MacBook and the volume is on the lowest possible setting, but it’s entirely comfortable and I can’t hear the click of the keys as I type. The only downside is that it can be a bit fiddly to put them on, especially since Shure recommend having the earphones curled around the ear. The quality of the audio from the earphones themselves is excellent. With the Apple iPod earbuds it was frequently a little tinny and lacking in depth. The SE210s deliver a lot richer sound with clear bass (although I tend to select the Bass Booster EQ setting on the iPod). Select a multi-layered track like Coldplay’s Speed of Sound – which I also note tends to be be loaded on the iPods in Apple stores, which usually have high-end Bose noise-cancelling headphones attached – and I can hear a lot of texture and detail, and pick out the individual tracks in the mix. As Nik says, there’s a danger of becoming an audio snob with these. The SE210s also come with an extension cable (the earphones themselves are on a foot-long “stub” of a cable so it’s lucky that the extension cable is in the box), and a carry case. All in all, quite a nice package. Worth a look if you want to upgrade your sound but continue to have portable earphones. Oh, I’d avoid getting them from the Apple store, since they seem to only be available at list price… the price is more reasonable (although still expensive as in-ear headphones got, but these are good quality) elsewhere such as Amazon. 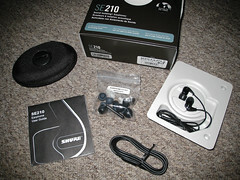 This entry was posted in Uncategorized and tagged audio, earphones, headphone, iPod, review, shure, Shure SE210. Bookmark the permalink. They do seem to work very well indeed. Might need to resort to throwing things at you to attract attention now! I believe these are the update to the shure e3’s that I recently got. The “micro-drivers” or whatever on the se-series are supposed to be updated and better. This is also my first plunge into the earphone thing…and I’m not looking back. I already have quite a bit of higher-end earphones bookmarked for a year or two down the road (including a few SE-series shures). I didn’t know I was a snobbish audiophile either. Luckily, I’ve been ripping my music in 192+ bitrates in preparation for situations just like this. I never imagined little, tiny earphones — and not a huge, expensive sound system — would be what I was preparing for. I’ve got some Shure isolating headphones. I’m not sure which ones they are as I’ve had them for years. They’re white and cost about £160 at the time if that helps! They do still sound good and they’re great on planes. Even without music they shut out most of the engine noise. Be careful if you’re plugged into the onboard entertainment system though, you have the volume turned nice and low, but if the cabin crew make an announcement in jumps up to full volume and really hurts, you could do some damage with them. The only thing I’d say against them is that they can be uncomfy if you’re trying to rest your head against something. I find it makes the wire that loops over your ear tighten, which digs in. This often happens if you lean against a pillow on an aeroplane. I also have some much cheaper (about £30) sennheiser ones and maybe the sound isn’t quite as good as the Shure ones (though there’s not much in it), but they’re a lot smaller, lighter and more comfortable if you have them in for a long time. Finally i found a earset that reproduces the frequency response of monitor quality headsets. The adjustable cable is odd, but very functional now that i am used to it. And the fit kit has a great range of options allowing for great fit to nearly any ear size/shape. Thanks for the nice review! I just ordered a pair today via Amazon to replace my failing Bose in-ear headphones.